ABC was the only network Monday morning to report on former NBC anchor Tom Brokaw’s comments that offended both the right and left on Meet the Press Sunday. 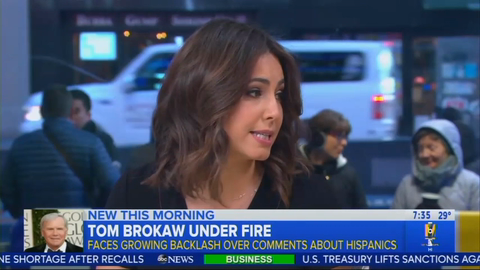 During a discussion on the border wall, Brokaw argued Hispanics needed to do a better job assimilating, and said Republicans didn’t want interracial marriages. That second part didn’t faze ABC, but the first part made anchor Cecilia Vega very upset.